The 1st month of the 2-month Fundraising Campaign is coming to an end – Has your church started fundraising? The church raising most funds takes the award. Funds will be used to shore up the Society’s capital fund, one focus is to help with expenses when staff travel to preach, teach & work nationally and globally. Here are a few possible fund raising ideas: (1) International Themed Church Dinners, (2) Members’ skills auction, (3) Bake sale, (4) Penny War, and (5) Weekly dedicated offering. 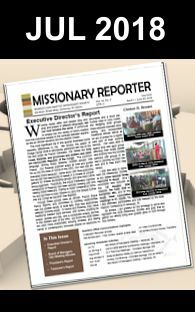 Last year’s award winner, First Hopkinton SDB, had committed to a budgeted giving on faith that God would provide what they committed to give to missions. They fulfilled their goals and found once again that they were not able to out give God. We also suggest the Give Thermometer Graphic Idea – one way to give members of your church an understanding of the goal and motivate them to get it done. We look forward to hearing about your fundraising activities. 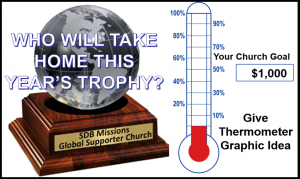 Your SDB congregation only has about one month (until May 15th, 2018) to participate in this fundraising campaign.